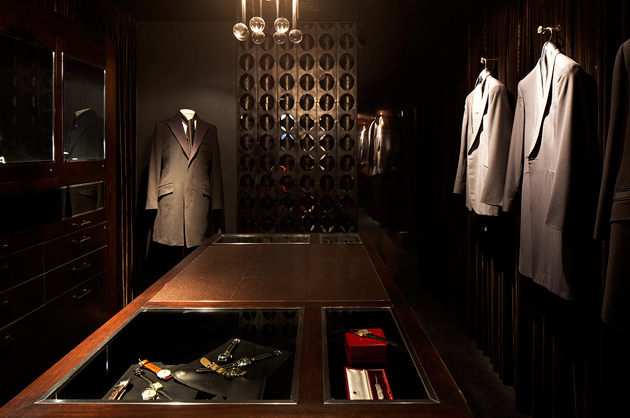 London based Luxury Mens Tailor Spencer Hart launches a new secret VIP dressing room. 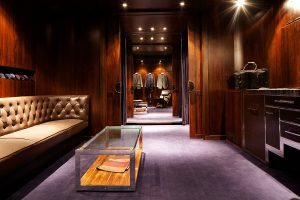 Spencer Hart has opened an exclusive new dressing area for VIPs, within the basement of their new flagship store on Brook St.
Aptly nicknamed ‘The Vault’, the room is located within the former vault of the bank that had previously occupied the property. Entered through a James Bond style private entrance on the ground floor using a key card, the whole experience provides privacy and comfort for VIPs. Recipients of the key card include P Diddy, Jay Z and Robbie Williams, who is one of the lead investors in Spencer Hart. The VIP service offers the best in bespoke tailored suits, similar to those offered at Spencer Hart, Savile Row and epitomises the brands reputation for luxury and style. The Brook St store itself is an oasis of luxury, from vintage to modernity. It encapsulates Nick Hart’s vision and iconic references of a modern utopia influenced by the likes of Neutra, Sinatra, Warhol and Kerouac, into a fresh and modern retail world for men. Spencer Hart founder, Nick Hart said, “The store’s ‘Savile Row meets Palm Springs’ design is carried through into the look and feel of ‘The Vault’. It is a place where our VIP customers can experience a personal world-class service that is synonymous with the Spencer Hart brand. We are excited about making ‘The Vault’ a destination in its own right”.